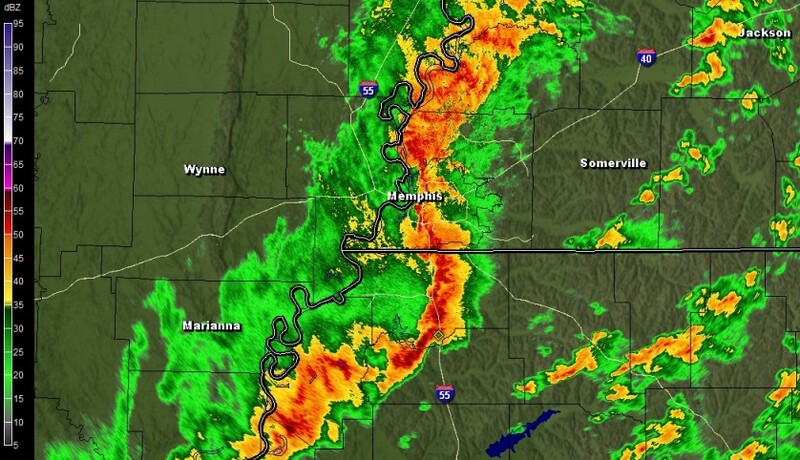 Contrary to Monday night's lead story on ABC World News, severe storms moved into the Mid-South with plenty of advance notice (MWN Blog post #1, MWN Blog post #2) on Sunday night. The morning started like a typical winter day - cool and cloudy - but quickly changed such that by late afternoon, it felt like spring as a very spring-like severe weather episode unfolded. By the end of the event, and certainly the next morning after seeing images of devastation in places like Fordyce, AR and Birmingham, AL, we realized how fortunate we were here in the Mid-South. Though several tornado warnings were issued in the eight-county metro area, we were fortunate to not have tornadic damage, even though the environmental setup strongly favored their formation. However, that doesn't mean the metro escaped completely. Teams of storm damage surveyors from NWS-Memphis visited a number of sites over the past couple of days to assess damage. The map below shows the reports of severe weather received in the metro during this event (wind, hail, tornado) with an interactive version of this map available here. 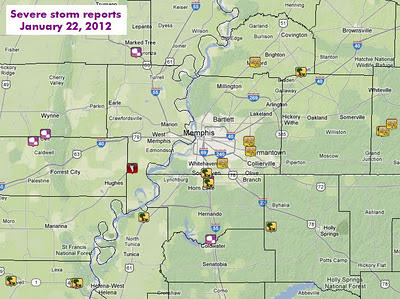 In the metro, reports of 58-65 mph wind were received in east Memphis and Atoka (Tipton Co.), multiple interstate signs were blown down on I-55 near the MS/TN state line, power lines were down in Robinsonville (Tunica Co.) and Mason (Tipton Co.), 13,500+ MLGW customers lost power, and straight-line wind of approximately 105 mph lifted a large roof off a building and dropped it 200 feet away across railroad tracks in an area just east of Memphis International Airport around 10:20pm. In the latter case (105 mph wind), we were able to retrieve the Doppler wind velocity data from the NEXRAD and have inserted an annotated version below. 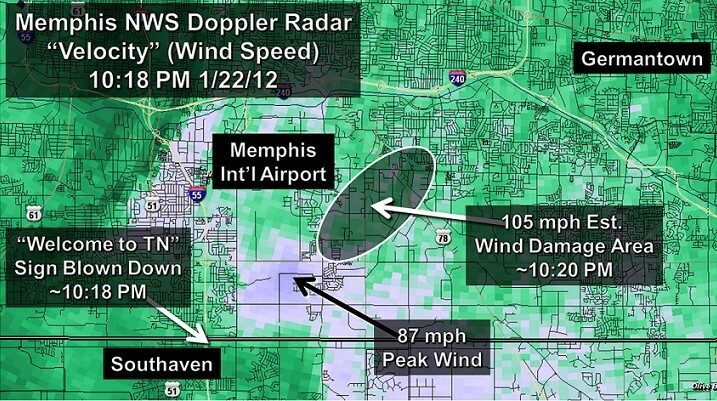 The radar detected 87 mph wind at an altitude of approximately 14,00 feet above the ground. Note the localized nature of the high wind field (small area of light blue color). In fact, the airport itself reported a maximum wind gust of 40 mph. We hypothesize that this damaging wind might have been the result of a downburst, or microburst, of wind from the thunderstorm overhead. 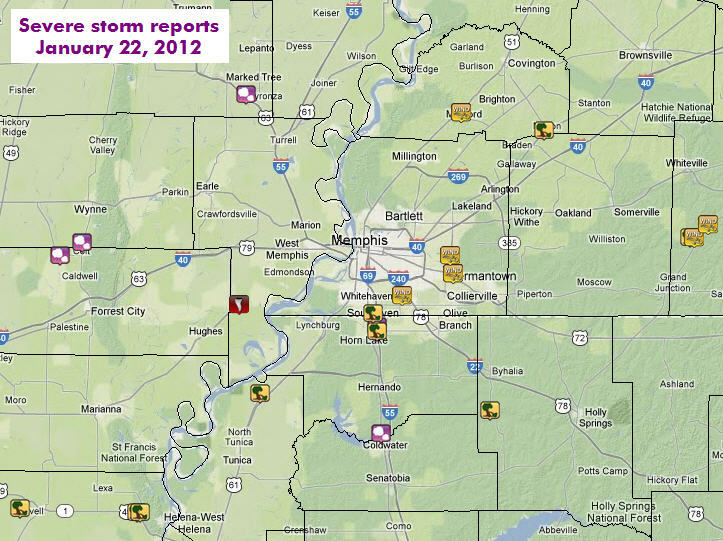 To recap MemphisWeather.net's efforts before and during the event, two blog posts (linked above) were written on Saturday and Sunday, describing in detail the potential for severe and damaging storms. 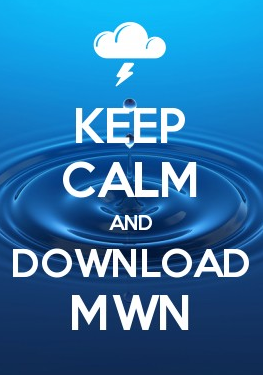 We used social media and the MWN Forecast to continually keep our followers abreast of the developing situation, including relaying safety tips ahead of time in order to properly prepare for the storm's effects. Beginning at 5pm (5+ hours before damage occurred in Memphis), we began our wall-to-wall nowcasting coverage of the storms, entering "severe weather mode" and splitting duties so that both Erik and Kevin could provide updates for the duration of the event. Our nowcasting efforts covered a total of 7 straight hours (including a couple of periods in which Twitter had significant issues that limited our ability to post) with a total of 265 tweets and untold number of Facebook posts. We covered the issuance of 6 Tornado Warnings and 10 Severe Thunderstorm Warnings, naming the communities to be impacted and when the danger had passed. Thanks to YOU and your referrals to friends and family, we also added well over 1,000 new followers on Facebook and Twitter, bringing us very close to the 10,000 follower mark among all our social feeds! We are so grateful that you choose to put your trust in us. It is not something we take lightly. Be safe and be weather aware. For up-to-date weather information for Memphis and the Mid-South, where and when you need it, visit MemphisWeather.net on the web, m.memphisweather.net on your mobile phone, download our Android app, and visit us on Facebook or Twitter.